de chaque personne est une étoile"
each person's voice is a star"
Bienvenue à bord de linguasphere.info, navire-web de l’Observatoire linguistique. Cet Observatoire est une organisation de recherche transnationale, largement bénévole, qui a été créée au Québec en 1983 pour ensuite s’installer en Normandie et au Pays de Galles. Ses activités portent sur les interactions entre toutes les langues de notre «linguasphère» planétaire. En 1993, l’Observatoire a complété et publié les premiers fascicules de son Répertoire en français, et en décembre 1999/janvier 2000, l’ensemble du Linguasphere Register, en anglais. En novembre 2012, à l’occasion du IIIe Symposium du Multilinguisme dans le Cyberespace à Paris, l’Observatoire Linguistique lance pour la première fois la publication systématique en ligne du texte complet du Linguasphere Register of the World’s Languages and Speech Communities, édition de 1999/2000. Ce Répertoire comporte la classification géolinguistique, le codage et l’index alphabétique de l’ensemble des langues, variétés et groupes linguistiques du monde. La structure de cette édition princeps du Répertoire fournit un cadre à la fois aux recherches en cours de l’Observatoire linguistique et aux développement et expansion de ce site en tant que service public gratuit d’information. Welcome aboard linguasphere.info, webship of the Observatoire linguistique. The Observatoire is a largely voluntary transnational research organisation, created in Quebec in 1983 and subsequently based in Normandy and Wales. Concerned with the interaction of all languages within our global “linguasphere”, the Observatory completed and published the first fascicules of its Répertoire in French in 1993, and of its entire Linguasphere Register in English in December 1999/January 2000. 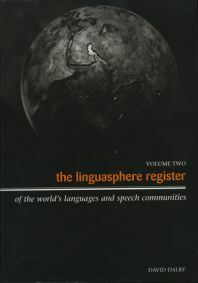 From November 2012, on the occasion of the Third Symposium in Paris on Multilingualism in Cyberspace, the Observatoire linguistique has launched the first systematic online publication of the entire text of its 1999/2000 Register of the World’s Languages and Speech Communities, including its geolinguistic classification, coding and alphabetic indexing of the world’s languages, language varieties and language groupings. The structure of this foundation edition of the Register provides the framework for the ongoing research of the Observatoire linguistique, and for the further development and expansion of this site as a free public information service. In recent years, l’Observatoire linguistique/Linguasphere Observatory has introduced its alternative short title theObservatoire (with optional space after “the”), as used for the parallel "pilot webship" to be launched before end of the Spring 2018: http://theobservatoire.org, accessible initially as a Google Site : see https://sites.google.com/view/wwwtheobservatoire. It is important to record here clearly, and with sincerest gratitude, that the greatly expanded and improved version of this linguasphere.info webship was due to the voluntary work and personal initiative of two friends and colleagues of the Observatoire, Margaret Dunham and Eric Agnesina, who donated generously of their time and expertise to the rapid re-development and relaunch of our original webship in its now first complete and openly available form, supported by the Institut français (as the original launch of the linguasphere(.net) site was supported by the British Academy, two decades ago in 1998). The prompt action of Margaret and Eric was crucial in saving the future of the Linguasphere Register at a critical juncture, from December 2012 onwards, by ensuring that the contents of its two volumes could at last made fully and freely available online under a Creative Commons Attribution-NonCommercial-ShareAlike 3.0 Unported License. Initially, it was hoped that this renewed webship might be further developed as a continuously updated bilingual resource, in French as well as English, keeping careful track of all incoming data on the world's languages. Sadly, it proved impossible for the Observatoire, as a small voluntary research association, to maintain this desirable task. On the other hand, events and experience have demonstrated that an alternative line of development may be of value in bridging the gap between (on the one hand) inevitable re-assessments of uncertain or prehistoric linguistic relationships, or revisions of data, and (on the other) the need to build a coherent and stable framework for the presentation of the realities of modern linguistic geography. It is at least partly for the reason of this gap that the history and modern geography of human languages and speech-communities (at least within children’s own continent) have been so rarely treated as subjects of general education around the world. The Observatoire was encouraged in this line of reflection when, in 2014, Wikidata.org (created in 2012 to collect structured data in support of Wikipedia) took the initative of recognising the Linguasphere Observatory language codes as a property (Wikidata P1396) for the unique identification of languages. This has resulted in the provision of an in-built editorial facility for incorporating Linguasphere referential codes into the info-boxes of (en. )Wikipedia articles devoted to individual languages, groups of languages, and important sub-divisions of any language. Most coding systems for the identification of languages (as in the case of ISO 639) are often based on practical abbreviations of language-names in the Latin alphabet. All codes from the Linguasphere Register, however, are based on a standard numerical key to a secondary Framework of fifty phylozones and fifty geozones of Reference, serving to organise what is known of their established relationships and/or locations, within a system of 2-digits (00 to 99). This primary Framework was only made possible by the fact that all human languages and language groups may be more widely organised, naturally and conveniently, within five major phyla or phylosectors of wider relationship or (if not) within five major continents or geosectors of wider location, within a system of initial digits (0-9, as fully presented and explained in Vol 1 of the Register, and fully documented in Vol.2, both now freely available on this site). Not a great many languages in the world are likely to be re-classified, after further study and consideration, but a modest number inevitably will be, especially within the five continental geosectors. For that reason, since Linguasphere codes are now increasingly cited in en.Wikipedia (fast becoming the most detailed and easily referenced collection of information ever compiled on the world’s individual languages), it is important that all Linguasphere referential codes should be guaranteed as stable for a conventional period. 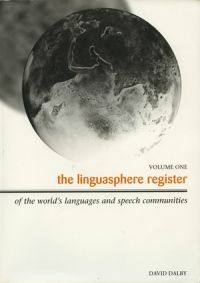 The Linguasphere Observatory will therefore ensure that the version of the Linguasphere Register completed in 1999/2000 will retain the stability of its coding system for a period of 25 years, when a consensus will be sought among relevant researchers, and from published materials over that period, in order to implement a single corporate change of all revisable codes (and their associated data) from 2025 (and again, if necessary and so desired, from 2050). The advice and agreement of Wikidata and Wikipedia will of course be necessary for this proposal (as a potential subject of debate at a future Wikimania meeting ?). In a century of perhaps the greatest demographic and linguistic changes ever known, it will doubtless be useful to conduct a global review of human ethnolinguistic relationships at broadly spaced intervals. In that same context, the Observatoire wishes to pay warm tribute to Dr Jens Rainer Roth, a computer specialist in Baden-Württemberg, who has been able – under the open Creative Commons licence of this site – to prepare a first user-friendly data-base for the entire Linguasphere Register, making this supplementary resource likewise fully and freely available (alongside a similar data-base for ISO 639) on the website hortensj-garden.org. The Observatoire expresses its gratitude for this valuable supplement to the Register, and for the subsequent advice and professional help which Jens Roth has readily provided on the subject of future online development and website management of the Register. Finally, with extreme pleasure, it is possible to announce the first ever publication (on this site from April 2018) of the original version of the Observatoire's Language Map of Africa, compiled by David Dalby between 1961 and 1975. First published by the International African Institute in 1977, this manuscript map presents the state of ethnolinguistic distribution throughout the continent to the end of the imposition of fragile European colonial frontiers. Warmest appreciation and thanks are now due - above all - to Sylviano & Valérie Freiré-Diaz and Victoire Desvois, a small family-team of cartographers at Rouen (Normandie), who have produced – freely and in dedication to the peoples of Africa – this first integrated GIS version of the Observatoire’s full language map of that continent, linguistically the most complex in the world. An earlier presentation of the original disjointed (and differently coded) 1977 manuscript version had already been organised on this present site by Sylviano, together with an in-built facility for its enlarged viewing (as still available here now, alongside his own single-sheet and equally enlargeable GIS version). One of the greatest issues in today’s world arises from the manner in which the ancestral plurilingual continent of our singly human race was arbitrarily carved up by the “great” European powers only 13 decades ago. The Freiré-Diaz version of Africa's pre-independence language-map will be integral to discussion of “The Deep Challenge” on the new webship of theObservatoire, now about to open as a companion to linguasphere.info. This first update to linguasphere.info was concluded on 25 April 2018. Comments, questions and offers of support will be welcome at linguareg@gmail.com.